Japanese maple trees are most often propagated by grafting, but the adventurous gardener can try to propagate these trees via a cutting. The best time of year to start cuttings from Japanese maples is mid spring, about one month after the trees start growing again. Take soft wood cuttings, which are new wood that's hardened slightly; these root better than old wood cuttings. Combine equal parts of sand and peat moss to create a rooting medium. Place this rooting medium in several 4-inch pots, filling one pot for each cutting you want to root. 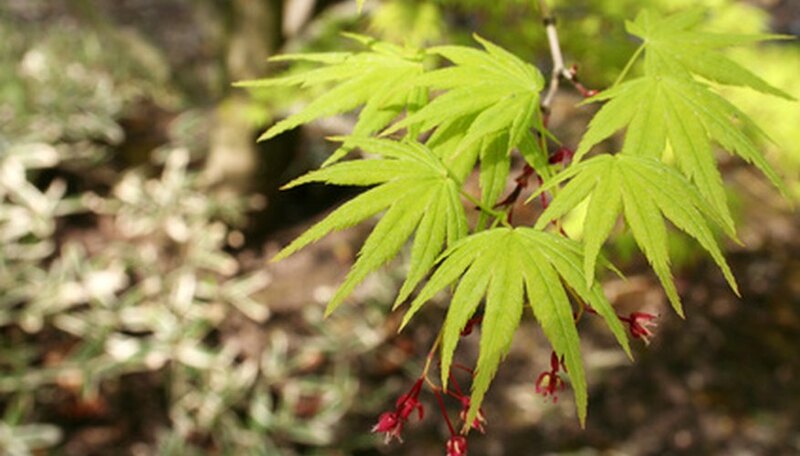 Take cuttings from your Japanese maple tree using anvil pruners. Make cuttings 6 to 8 inches long and use small but healthy branches for the cuttings. Since not all cuttings will root, take more cuttings that you want. Remove leaves from the bottom third of your cuttings. Scrape away the bark along the bottom 1/2-inch of the cutting to create a wound. Maple cuttings root better when wounded, according to Sooner Plant Farm. Dip the end of the cutting in a rooting hormone powder. Place one cutting in each prepared pot, burying 1 inch of the cutting in the rooting medium. Water your newly planted cuttings until the rooting mix becomes quite moist. Move your Japanese maple cuttings outside to a partially sunny area. Cover the pots with a plastic bag to promote humidity. Check the moisture level of the rooting medium and water it daily to keep it moist. The cuttings should root in 2 to 3 weeks, according to Sooner Plant Farm. How Do I Take a Tree Cutting?